When it comes to a room, there are so many things you can do to bring it to life. A coat of paint can define a space easily. However, nothing can bring your personality out better than a picture. At Topside Inn, we have carefully selected the artwork that is in our rooms and common areas to reflect our area and style. A great way to bring a piece of your time here in Maine home is a piece of art. There are many art galleries to choose from. Many are found in our Vacation Guide. One amazing place to go to purchase local art is Abacus Gallery. Let’s have a look at what you will find while you are there. There are many Abacus Gallery locations in Maine. You will be able to find one in Kennebunkport, Portland, Ogunquit, and Freeport. However, our Boothbay Harbor location is the first. This Abacus Gallery opened its doors in 1971. Since then, locals and visitors alike have enjoyed purchasing pieces from the gallery. 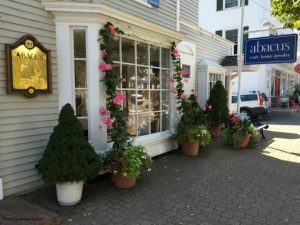 You can find our Abacus Gallery nearby on McKown Street in the heart of downtown Boothbay Harbor. What makes Abacus Gallery so fantastic is the variety of items you can find there. The gallery is an ideal location to find a gift for a friend or something for yourself. Here are a few types of pieces that you can find while you are there. Jewelry- Ed Levin’s designs are simple, stunning and easy to wear on a daily basis. They have earrings, bracelets, necklaces, and rings. Many of his designs only feature metal. A few of them have precious stones as well. Spiritiles– American artist Houston Llew is a gifted artist when it comes to these tiles. They are made from molten glass and copper. Each has a different scene that can take you back to another place in time. You will find the saying for each piece stamped on the side. To display, they can stand on their own or be hung. They would be a great addition to any home. Home Decor– When you think about home decor at Abacus Gallery, you will think about inventive and unique items that bring out your personality. Examples of what they have are metal animal sculptures, clocks, prints, and more. Prints- Of course, no gallery would be complete without prints. Local artist Dana Heacock has a number of wonderful prints hanging at Abacus Gallery. One of the reasons why so many love his work is that it represents the area so well. 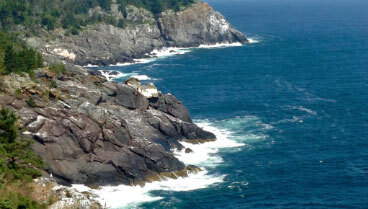 You will find pictures of fishing boats, lighthouses, boat houses, beach rocks, and so much more. Any of his prints would be a fantastic reminder of your trip here to Boothbay Harbor. As you can see, a visit to Abacus Gallery should be on the top of your list each time you are here in Boothbay Harbor. Our wonderful local businesses are one of the main reasons so many people enjoy coming here to Boothbay. Thinking of planning a trip to Maine? 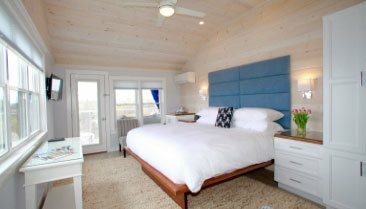 Consider staying with us at Topside Inn. Not only do we have breathtaking views of the harbor, we are also conveniently located close to downtown and other area activities. Our B&B has 3 buildings of rooms for you to choose from. If you enjoy your privacy, there is also our Water’s Edge Cottage. 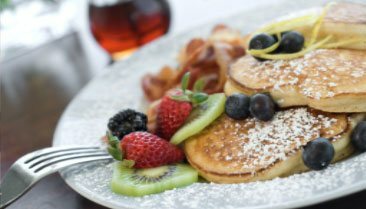 Each morning you are with us, join everyone for a delicious homemade breakfast. Contact us today and begin planning your next trip to Boothbay Harbor! 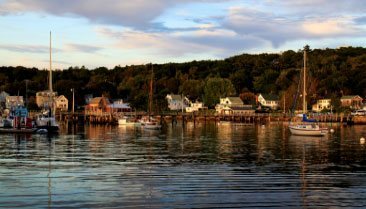 Grab your free Vacation Guide today and see what Boothbay Harbor has to offer you!